TORONTO — Words were hard to come by for Toronto FC's captain after his side's latest setback. Eight days after watching defender Chris Mavinga get sent off for violent conduct following TFC's 2-2 draw against Atlanta United, Michael Bradley had to try to rally his troops after teammate Jozy Altidore was dismissed just 11 minutes into Sunday's eventual 3-2 loss to New York City FC (14-5-5). Now seven points back of the sixth and final playoff berth in the Eastern Conference with 11 games to play, the reigning MLS Cup champions (6-12-5) saw an already-uphill climb get even steeper. "Play a big game, you go down to 10 guys after 10 minutes," Bradley said. "You've got a group of guys who fight and scrap and claw to try to give ourselves a chance and along the way we give up some soft goals." Those goals included a poor-headed clearance from Justin Morrow which led to David Villa's opener four minutes after Altidore received the red card, a left-footed drive from outside the box from Ismael Tajouri-Shradi that squeezed under Alex Bono and a second from Tajouri-Shradi in the 88th-minute that stood as the winner. Sebastian Giovinco equalized for TFC in the 27th minute and Victor Vazquez did so again in the 51st, but the Reds couldn't hold on for a draw. Greg Vanney called the loss "self-inflicted," but it was the manner of the two red cards of late that left him exasperated. "It's unnecessary and all it does is undo our ability to take steps forward," he said. "We were on six-(game) unbeaten and moving in a good direction and this is not the moment we needed." The red card, the fourth of Altidore's TFC career in both the regular season and playoffs, will result in at least a one-match ban, meaning the club will be missing both the United States international as well as Mavinga, who had an extra one-game suspension tacked onto his red card Friday, next weekend in San Jose. Altidore was caught in possession by defender Alexander Callens, and kicked out at the Peruvian international. Bradley said the red card was likely warranted, though he felt the referee had allowed the incident to spiral out of control. "It's probably a red card but it's also a foul before the red card," he said. "Jozy gets fouled but at the end it's a red card." 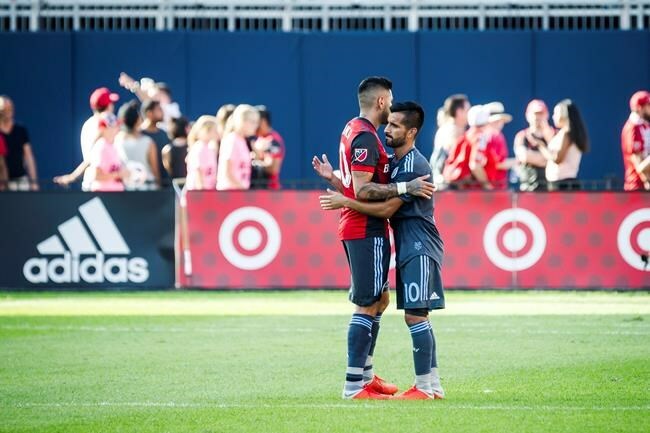 Villa, who scored his eighth goal in eight regular-season appearances against TFC, said Giovinco's goal had the potential to turn the tide, particularly against a team that enjoyed a 20-10 shot differential over the 90 minutes. "The goal of Giovinco killed us a little bit because we felt that we had control of the game, we felt that we were going to score more goals," the Spanish World Cup winner said. "We had many chances in the first half and we are with one man more. So the team is feeling good and … the goal of Giovinco is a punch in the face." Toronto FC will now have to pick itself up in time to face the Vancouver Whitecaps in the second leg of the Canadian Championship final Wednesday following last week's 2-2 draw on the West Coast. With that in mind, one positive to come out of Sunday's loss was the return of Drew Moor, who was out since TFC's game in Colorado on April 14 with both quad and calf muscle injuries. The veteran defender was brought on in the 71st minute to make his fourth appearance of the season and was happy to make it through the last 20 minutes unscathed. "It's mixed emotions obviously," he said. "Always awesome to get back on the field after a layoff, but disappointed not getting anything from the game."